Music has always inspired me. Here I can express how I feel about it. Work ethic, passion and creativity creates the perfect viral storm for Italian rock fans. To call Fabio Zaffagnini a fan of the Foo Fighters would be a huge understatement. I would say he’s their biggest fan because this week social media blew up over a video he created powered by a movement of Italian rockers and a crowdfunding campaign –Rockin 1000 with a goal of assembling 1000 musicians to play “Learn To Fly” and personally invite Dave Grohl and the Foo Fighters to play a concert in Cesena, Italy. 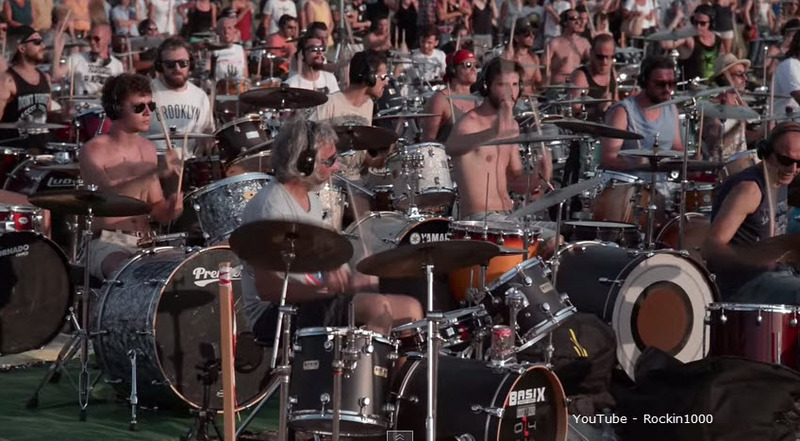 In the video we can see a massive band consisting of drummers’ bass players’ guitarists’ and singers, 1000 in all who convened on an Italian field in May of 2014 with two goals, 1) break the Guinness World Record for the number of people on a single stage, and 2) make a personal plea to the Foo Fighters. When I watched the video this morning I found it strangely moving. Being a musician myself and also a fan of the Foo Fighters I found myself becoming moved to tears by the conviction and passion displayed by the Italians. I can only imagine what Dave Grohl and the rest of his band thought of this creative achievement. Let’s talk about Dave Grohl’s work ethic for a second. A few months ago he fell off stage in Gothenburg, Sweden and broke his leg. He was temporarily hospitalized while the audience in the stadium waited for word on his condition. Rather than taking a powder, Grohl asked his roadies to set up a chair and support his leg which was by then in a cast so he could continue the show and finish the performance for the fans. What does that tell you about work ethic? It not only speaks volumes for his love of rock ‘n roll, but also his dedication to Foo Fighters fans, it also says a lot about his professionalism in finishing what he started. I’ve long admired Dave Grohl for his work ethic, he really does work hard at his craft, and he truly lives the dream. But while we are talking about Dave Grohl’s work ethic we can’t ignore the tremendous commitment and organization it took to pull off this social media spectacle. The crowdfunding campaign raised over €44,000. It was filmed professionally and edited for maximum impact, every detail including crowd volume control was planned out, you’ll notice in the video at the end how Fabio Zaffagnini can speak while the crowd listens in perfect silence while he makes his appeal directly to the band. Try doing that with thousands of people in an open field. Not easy. The logistics for this video were amazing. For one, how do 1000 musicians keep perfect time? In the video you can see the conductor but immediately below him on the riser you can see lights pulsing to the beat of the song so all could play in perfect time. Most of the musicians have microphones and real instruments plugged in, it must’ve sounded awesome. A drone took spectacular aerial footage, GoPro cameras were mounted in front of the conductor and in several vantage points. And the close-ups of the crowd having the time of their lives brought the whole thing to life. It was authentic and real, and it was AWESOME. Word of the video spread fast. It was published two days ago on July 30th and has already received over 12 million views on YouTube alone. It wasn’t long before Dave Grohl himself sat down with his phone to record a short statement for Rockin 1000 and the people of Cesena, Italy. Hello Cesena. It’s David. Hi. I am sorry I don’t speak Italian, just a bit, a bit. This video, was good! Super nice. Thank you so much. We’re coming, I swear. We’ll see each other soon. The world of crowdfunding is making amazing things happen around the world. New products are being developed, breakthroughs in science are happening, creative endeavors like this one are becoming a reality, dreams are coming true. Fabio Zaffagnini made his dream come true through crowdfunding and the Internet. These are amazing times my friends. My wife and I were lucky enough to see Adele the first time she came to America, shortly after her first album “19” came out. The show was at the Roxy on May 21st, 2008, it was awesome. Adele wasn’t very well known at that time, but word was spreading fast. Anyhow, we stayed after the show and met Adele, who was delightful and real. 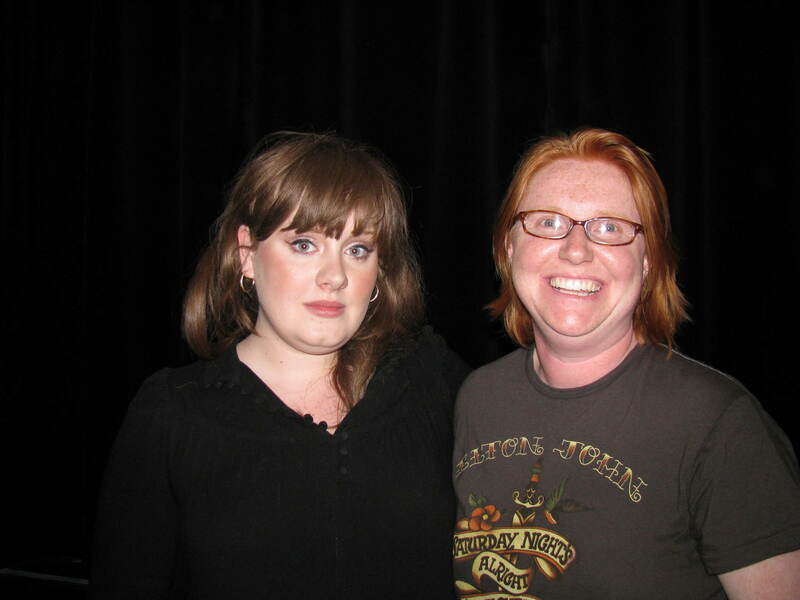 When I spoke to her I told her she would win a Grammy for “19”, to that she exclaimed “Oh stop!” There was a girl there who had us take a photo with Adele. I suppose she never had a camera. Anyhow, I’ll post it here in the off chance she is still Googling the “Adele Show at the Roxy from May 21st 2008” looking for that image. Without further ado. Anyone who knows me personally will soon learn how much I love The Who. It’s almost like I look for an opening to mention a great Who song or one of their great rock operas, TOMMY or Quadrophenia. My love for The Who started early when I was about 8 years old, having heard the acoustic guitar introduction to “Pinball Wizard” and thinking, “I have to learn how to make that exact sound”. I was too young of course to understand many of the dark themes in the lyrics to TOMMY, was even turned away from a cinema in Camberley one Saturday when my Mum took me to see the movie. My Mum loved The Who, though her favorite has always been Roger Daltrey. I wanted to know who did that with the guitar and that person was Peter Dennis Blandford Townshend. I picked up a guitar and the inspiration was born. I followed The Who and the solo career of Pete through good times and the bad. He was not only The Who’s primary songwriter, but arguably the most entertaining guitarist to watch on stage. I found his music both inspiring and a constant source of comfort to me over the years. It’s in the words of songs like “Behind Blue Eyes” for when I am feeling misunderstood, it’s the fading end to “Bargain” when I I yearn to be taken away by the majestic groove, it’s my teenage years walking around hopeless Aldershot, England in “Rough Boys.” It’s in “Exquisitely Bored in California” shortly after emigrating to America as a teen. So you can imagine my delight in late 2005 early 2006 when Pete decided to open an account on Blogger and start releasing chapters of his novella “The Boy Who Heard Music” each Saturday, interacting with fans about the story, offering insights on the writing, and holding our attention for about three precious months. Over the course of the project a core group of around 100 bloggers became friends and started to connect with each other. We would start to read each others blogs, learn about each other’s lives. There was Maria in Finland who would soon graduate with a PHD, there was Gina B and her dog Beatrice or “Bea Bea”, the two were never photographed separately. There was a mysterious character named Tommy D who would post incredibly long verbose diatribes which would sometimes get a rise out of Pete, and finally there was a fellow named Neil Emery who went on to become one of the greatest friends of my life who I never met in person. Neil was a wonderful funny guy who would post the most hilarious blogs about meeting Pete, or other famous musicians. He would mock up photos in Photoshop of himself standing next to Pete and put “I love this guy” with an arrow pointing to himself on Pete’s tee shirt. Sadly, Neil passed away a few years ago at a very young age. I grieve his loss to this day, he was a comedic genius. Feeling sad and inspired and wanting to say more, I picked up my guitar and started writing a song that would capture my feelings about what we had just been through. I wrote and recorded “Walking On The Grid” in my little home studio. In “The Boy Who Heard Music”, the Internet was referred to often as “The Grid”, and meeting people from all around the world felt very much like walking on a simple grid to friends in close proximity. These were now people with whom I interacted with on a regular basis, they were people I considered friends. After I recorded the demo of the song, friend and blogger Paul Biscardi contacted me asking permission to use the song in a video tribute he was working on for Pete. Paul created a wonderful montage video with clips of Pete in his studio and pictures of the bloggers who I mention in the song. Around this time, Pete’s partner Rachel Fuller had started an Internet chat show called “In The Attic” with her childhood friend Michael Cuthbert. 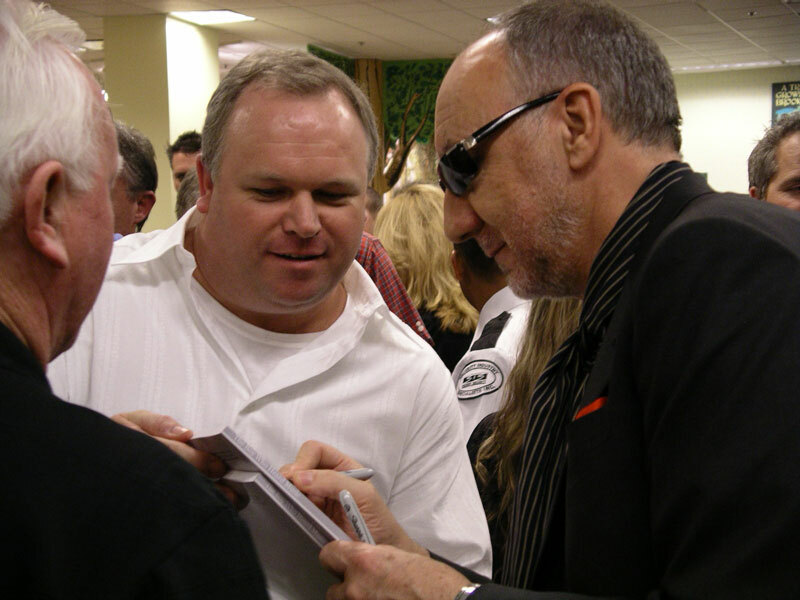 Pete would regularly guest on the show with his younger brother Simon Townshend. The show was cutting edge. Several notable artists of today appeared on the show. Adele sang two songs in one episode and sat chatting with Pete and Rachel while smoking cigarettes. It was a wonderful follow-on to the now defunct “Boy Who Heard Music” project. In April of 2006 Pete and Rachel premiered Paul Biscardi’s video. It was one of the most amazing birthday presents I have ever received, having my idol sit there talking about a song I had written. It felt so wonderful hearing him interact with us on that level. In 2007 Pete, Rachel and Mikey took “In The Attic” on the road with The Who. Rachel had just released a new solo EP and was promoting it across the country in appearances in Barnes & Noble, so we went up to The Grove in Los Angeles to one of the events and met Rachel and Pete, who was there to support her. He was so very kind, and signed a copy of “The Boy Who Heard Music” which I had specially bound for the occasion. I gave Pete a copy too. We had a wonderful conversation about an unpublished Who song called “Uncertain Girl”, and Pete gave me the back story on the song, knowing I knew all of the words, he disclosed the song was about Sinead O’Connor, who had invited him to give her away at her wedding. I think back on this period between 2005 and 2007 with such fond memories. I got to meet my idol. I got to write a song. I got to make new friends. I grieve the loss of a friend I never met. What a wonderful journey that was. 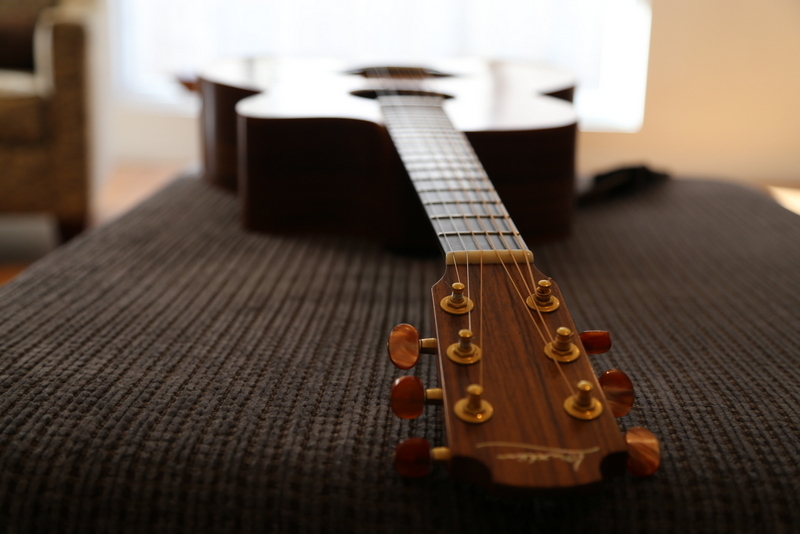 Getting the guitar out for a pluck. I love to play this tune. 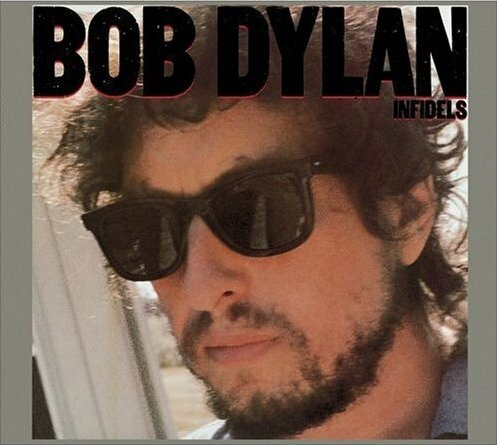 One of my favorite Bob Dylan songs is “Sweetheart Like You” from his Infidels album. When I first heard it I was taken aback by the words, how Dylan was able to weave such a poignant story with cinematic qualities. That’s why there will be no songwriter in our time quite as good as Bob Dylan. When I listen to this song I picture a seedy bar, almost empty and a sweet little old lady who cleans up after the drunks. I couldn’t have imagined these scenes in my mind without Dylan’s words. Dylan creates these visions for us lyrically. It was Bob Dylan who wrote “Make You Feel My Love“, not Adele. Adele is a great singer and songwriter in her own right, but you have to hand it to her for admiring greatness like that. Here are a few lines from “Sweetheart Like You” by Bob Dylan. We’ll the pressure’s down, the boss ain’t here, he gone north for a while. They say that vanity got the best of him, but he sure left here in style. By the way that’s a cute hat, and that smile’s so hard to resist. What’s a sweetheart like you doing in a dump like this? You know I once knew a woman who looked like you, she wanted a whole man, not just a half. She used to call me sweet daddy when I was only a child, you kind of remind me of her when you laugh. Take a listen and tell me what you think, does this song move you in the same way? One of the things I find most frustrating about being deaf in one of my ears is the experience I have listening to music on headphones. For many years technology companies ignored this problem, thinking that everybody who had headphones could hear the music in both ears. On recordings made in the 60’s and 70’s it was quite common, due to track limitations, for essential parts of a song to be heard either on the left or the right. This is called panning. One of my favorite songs is “Substitute” by The Who. The song opens with a strident guitar riff playing in the left channel, but because I’m deaf in my left ear all I usually get is a tickling sensation, the indication that sound is being pumped into my ear but indistinguishable. If I turn speakers on sure I can enjoy the song, but at work it’s next to impossible. I recently purchased a new iPhone 5s from Apple, it now contains my entire music collection. This morning I was amazed to see how far along accessibility settings had come for the deaf and hard of hearing. 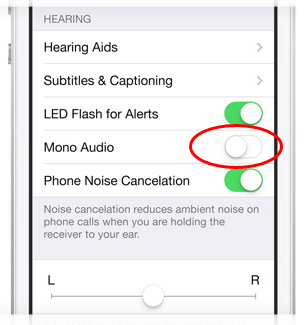 They now include a setting for mono audio which will blend the sound from a stereo track into a mono track that can be heard in both earphones evenly. This has been an absolute godsend for me because I can only year out of one ear. Since I discovered it this morning, I’ve been sitting here listening to all of my old 60’s and 70’s songs on the iPhone enjoying every riff, every chord as if I were listening on speakers. The engineers at Apple have clearly responded to their customers by building in these exciting features. I imagine many partially deaf people have written to Apple imploring them to do something and they responded brilliantly in this software release. Thank you Apple for enabling me to enjoy my music.